There was some discussion of fear vs. greed the other day in the comments section of the blog. The discussion revolved around whether they were mirror images of each other. My contention was that they aren’t and I pointed to the study regarding Worden Bros. overbought indicator from Monday as evidence of that. There are many ways to look at fear vs. greed. Today I’ll touch on the topic a bit more. For today’s study I first applied a zig-zag indicator to an S&P 500 chart to identify all places where the market rose or dropped at least 10% before swinging 10% in the opposite direction. Below is a copy of that chart. While a reversal after a 10% move is an overly-simple and perhaps not terribly accurate definition of a “top” or “bottom”, it does well enough to make today’s point. For instance, I doubt many traders would refer to 10/13/08 as a “top”, but it qualified, so I used it. 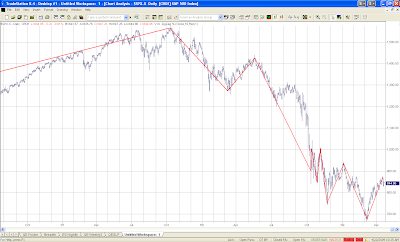 I then took the dates of the last 12 tops and the last 12 bottoms going back to 1999 and ran a few simple tests. The first simply looked at VIX levels. 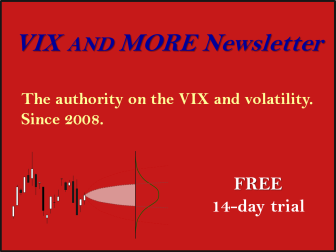 The VIX is often referred to as the “fear index”. It’s really more a measure of expected volatility based on options premiums, but when traders are fearful it tends to spike. I then took an average of the VIX for the tops and the bottoms. At the tops the average VIX reading was 27.41. At the bottoms the average VIX reading was 47.70. 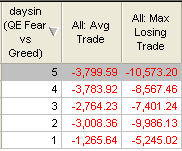 This confirms the obvious point that traders are more fearful at bottoms than tops. It also suggests that expected volatility is much higher at bottoms. This volatility can present opportunity. But while the expected volatility is much higher, what about the actual volatility after the top or bottom has been made? Now look at the 1-5 day returns of the 12 bottoms. People are too greedy at tops and too fearful at bottoms. Fear is a much stronger emotion, though. It therefore results in much stronger market moves. 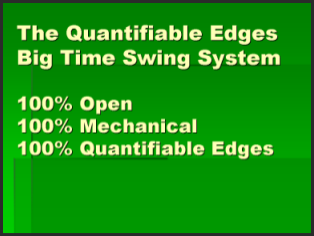 When trading overbought/oversold methods, traders should take this into account.